Monday night after work, Tyler and I headed to one of my favorite local spots, Rolando’s, for my birthday dinner with him. 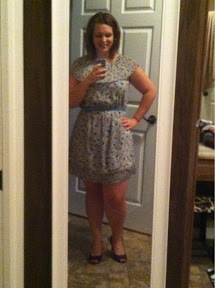 I wore a cute new dress that I got several weeks ago in Hot Springs. We had a great time eating and talking and laughing. Fat and happy after eating our delicious dinner. Tuesday, I had a GREAT birthday! 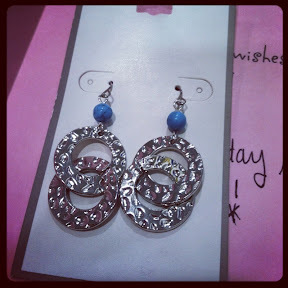 As soon as I got to work, my sweet coworker Christina gave me these earrings in a sweet card! 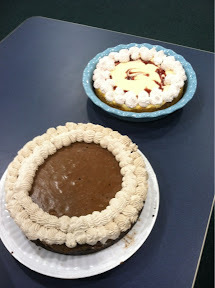 Then another coworker, Leanna, made these two DELICIOUS cheesecakes for me! Mocha and strawberry. I may or may not have had three delicious pieces. I’ll never tell. 😉 Good thing calories don’t count! This was the surprise of the century. In 4.5 years of being together, I have NEVER gotten flowers from Tyler. He claims they are impractical and stupid and expensive. 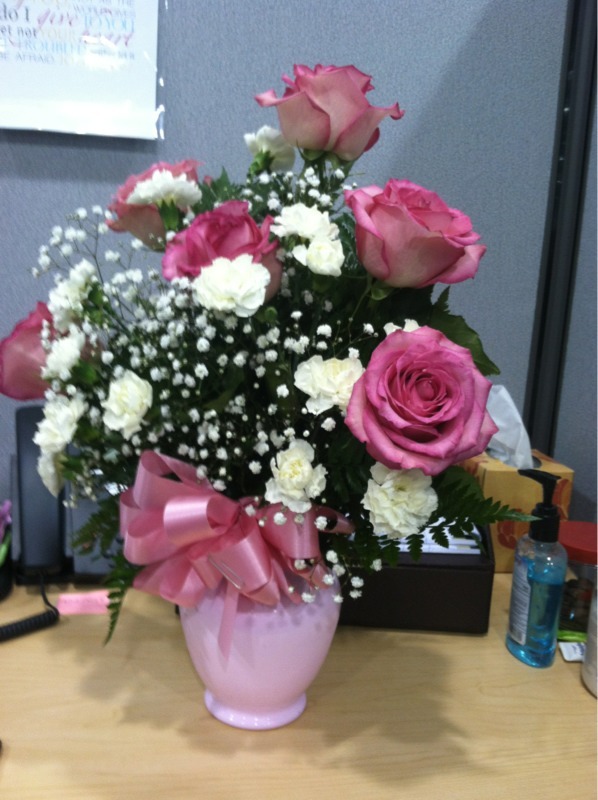 Well, when these showed up at work, I thought they were from my MIL (who has sent flowers a couple times), but they were from TYLER! They are so beautiful and make my cubicle smell of sweet roses. 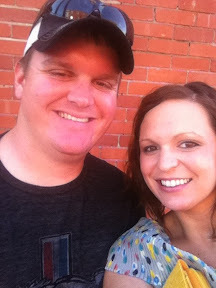 I am one lucky lady! 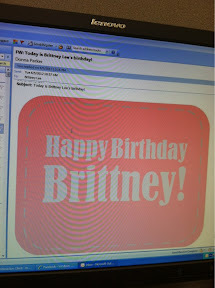 Also, at work, they send out mass emails to the 100+ people in our company about your birthday…so all day I got happy birthday messages (along with countless Facebook and Twitter posts! Some folks got in on the 80s action! After Zumba, we showered and got ready then went to dinner. We tried Bravo, an Italian place in town. 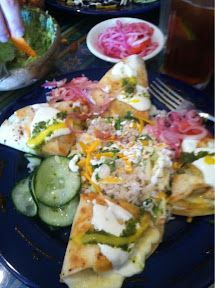 The food was soooo good! The atmosphere was a little funny because its an old Pizza Inn, so while the food felt like a fancy place, you would look around and expect to see a pizza buffet! ha! Me and cousin Caitlyn who came to town to Zumba with me! A Zumba student, Alicia, got me this adorable cookie cake! Momma. She came to Zumba and celebrate with me. My MIL Nancy. She went all out like it was Christmas and got me several gifts. I got a really neat Emeril 8-in-1 cooker that does rice, sautees, steams, slow cooks and more! I can’t wait to play with it! When we got home, a great song was on the radio so Tyler and I danced in the driveway. It was a great day. I felt so loved from work, to Zumba to the outpouring of love and well wishes from friends and family. I am so blessed. If the rest of the year is any indication of how yesterday went, I am in for a great 25. Happy Birthday again girlie!! It looks like you had a great day!! Your hubby did great with the flowers! It’s SO sweet that you guys danced in the driveway…that sounds like something that would happen in a movie! Thanks Emily! It was so great! It was funny that we decided to dance in the driveway since mom was there to take pictures! ha! A great end to the day! Love the flowers! I’m sure Tyler got mega husband points for those! I’m glad your birthday was great! Enjoyed the pics! P.S. Your 80s Zumba outfit is so rad.